Even the most reliable vehicles need regularly scheduled maintenance and repairs from time to time. Our expert auto repair technicians at AAA Car Care have diagnosed and repaired thousands of Toyotas. Plus, we have 36 Car Care locations in the Carolinas to choose from, including Charlotte, Raleigh, Greensboro, Greenville, Asheville, Columbia, Charleston, and Wilmington metropolitan areas. Even if your Toyota is still under warranty, you don’t have to use the dealership for routine maintenance. If your Toyota vehicle warranty has expired, AAA Car Care offers a variety of service options, from our free multi-point inspection to brake replacement to oil changes and fluid exchanges. Whether you need maintenance and repairs on your Toyota Corolla, Toyota RAV4, Toyota Celica, the fuel-efficient Toyota Prius, or any other Toyota model, we have a wide range of automotive services for your vehicle. Routine oil and filter changes are critical to the long-term health of your vehicle. Oil changes keep your engine running clean and improve performance. 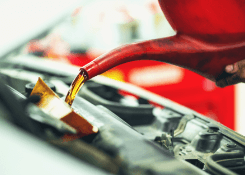 At AAA Car Care, we provide several oil change options to best suit your vehicle’s specific needs. Our highly trained and knowledgeable service consultants can help instruct you on the type of oil that is best for your vehicle. 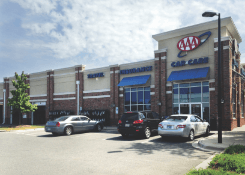 AAA Carolinas has over 30 locations throughout the Carolinas to provide you peace of mind with your vehicle. Peace of mind begins with knowing your vehicle will start even in extreme temperatures. Don’t be one of the 200,000 stranded in the Carolinas each year. Bring your vehicle to your local AAA Car Care Center to have your battery and starting system checked. Many factors go into selecting new tires, like weather conditions, fuel efficiency, tread life and price. 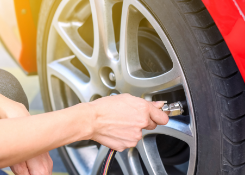 Your AAA Car Care professional can help you choose the right tires for your vehicle. Prefer to choose your own tires? Browse our online tire shop, buy them online, and have them shipped directly to your local AAA Car Care center for easy installation. Is your car’s air conditioning blowing hot air? It may be time for a tune-up! Your AAA Car Care professional can assist you with any maintenance and repair needs for your air conditioning system. We’ll help keep you cool! Wheel alignment is important for your vehicle’s suspension system, but it can be hard to know when you need it. If you can answer yes to any of these, you may need alignment service. Does your car drift to the right or left? Do your tire tread look unevenly worn? Has it been over a year since your last alignment? Come into AAA Car Care today for a free alignment evaluation! Your vehicle’s engine relies on properly functioning belts and hoses. If you’re not sure whether yours need repaired or replaced, come in to your nearby AAA Car Care center for an inspection. We can check all the belts to make sure they’re in proper working order. If you do need a replacement, we can install it for you today! You know your brakes are important—take care of them by making sure they’re working safely. AAA Car Care offers complete brake maintenance and repair services, so if you hear squeals and screeches when you hit the brakes, come in and let us take care of you. If that “Check Engine” light has lit up your dashboard, you don’t want to delay! Bring your vehicle into your local AAA Car Care center. We can diagnose the problem and get it fixed. We also have services to improve fuel and engine efficiency. Preventative maintenance is the key to improving gas mileage and keeping your vehicle running for years. Part of that preventative maintenance is routine system flushes. These services keep your vehicle’s systems well lubricated and help your vehicle run more efficiently. In North Carolina, AAA Car Care is a NC State Inspection Provider. We want to make your vehicle inspection easy for you and our North Carolina AAA Car Care locations offer both safety and emissions inspections, along with a full range of automotive maintenance and repair services. Repairing or replacing your transmission can be costly, so it’s important to maintain it properly. Whether you’ve got Automatic or Manual, AAA Car Care can service your vehicle’s transmission with routine maintenance, repairs and adjustments. Talk to one of our service professionals to see how we can help you! Preventative maintenance is critical to keeping your vehicle running smoothly. With Tune Up service, Electrical checks and Differential service, your AAA Car Care center has the services you need. We recommend most vehicles get a Tune Up annually. Check with your service professional for more recommendations. At AAA Car Care, we seek to provide our customers with education. We want you to feel confident with your service decisions. We’re always open to questions. When you come in to AAA Car Care, we offer a free inspection to make sure we don’t overlook an important service for your car. If we find something unexpected, we can service it before it needs costly repairs; if we don’t find anything wrong, you get a little peace of mind. Each of our stores has an Automotive Service Excellence (ASE) Certified master technician supervising and assisting with a full range of repairs including electrical systems, air conditioning, brakes, alignments, oil changes, preventative maintenance, tune-ups and more. If your vehicle requires preventative maintenance, air conditioning work, under hood or under car repair, or sophisticated diagnostics, AAA Car Care Centers have the technicians and commitment to deliver the level of service you have come to expect from AAA. Schedule an appointment online for auto repair, oil change service, tires, battery checks and more. Our highly trained service consultants can help instruct you on the type of oil that is best for your vehicle. We are committed to providing peace of mind to shopping and purchasing tires online.